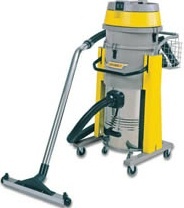 The Ghibli AS 40 industrial wet & dry vacuum cleaner is the perfect machine where high performance is required. It has a large 60 litre removable stainless steel container on casters. The AS 40 can be used for wet & dry use simultaneously as its 3 powerful motors are protected by a water float system, polyester & cartridge filters. 50mm accessories allow larger objects to be sucked up with ease.